Posted on 6, September 2016 by EuropaWire PR Editors | This entry was posted in Automotive, Energy, Gas & Oil, Norway, Transportation & Logistics, Travel and tagged Fortum Charge & Drive, Jan Haugen Ihle, Norway, Tesla, world’s largest charging station. Bookmark the permalink. 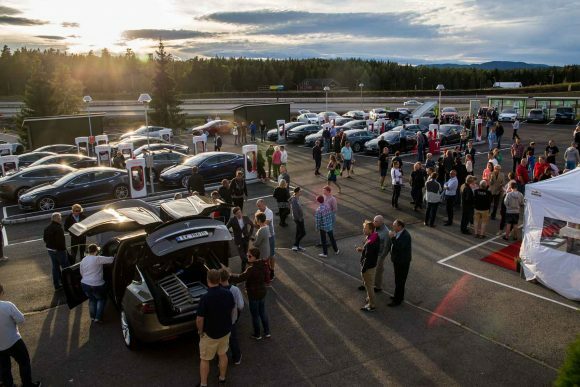 Nebbenes, Norway, 06-Sep-2016 — /EuropaWire/ — Fortum Charge & Drive and Tesla’s charging station was opened on 1 September in Norway and is the world’s largest charging station with 28 charging points where all types of modern electric vehicles can be charged. The station is a crucial addition in connecting Oslo, Lillehammar and Elverum. – 28 charging points that can be used simultaneously makes this the world’s largest charging station for all types of modern electric cars. This is something we are very proud to be a part of, says Country Manager Jan Haugen Ihle at Fortum Charge & Drive Norway. At Nebbenes, 45 minutes north of Norway’s capital of Oslo, there will be plenty of charging capacity. At the station Fortum Charge & Drive offers four fast chargers with CCS/CHAdeMO connection and four type 2 medium fast charging points with 22 kW power. In addition, Tesla offers 20 Superchargers at the same location. Fortum Charge & Drive is currently building charging corridors along the highways connecting the major Norwegian cities. Before the end of the year, Fortum will offer charging stations with CCS/CHAdeMO fast charging capabilities every 50 kilometer (31 miles) between the cities of Oslo and Trondheim, Oslo and Bergen, Oslo and Kristiansand, Kristiansand and Stavanger and Stavanger and Bergen. Fortum is also providing charging stations for EV owners further north, connecting the cities of Trondheim and Bodø. – So far this year we have installed about 160 new CCS/CHAdeMO fast chargers in Norway, with a lot more on the way before the end of the year, says Jan Haugen Ihle. Fortum Charge & Drive is a pioneer in electric vehicle charging and operates in Norway, Iceland, Sweden and Finland. In total, the network consists of more than 812 affiliated smart chargers in the Nordic countries. Charge & Drive offers a cloud-based service for quick charging of electric cars with an easy payment function via SMS, RFID tag or web application. In addition, the service monitoring and operation of the charging stations allows them to be managed remotely to improve accessibility. The service also gives electric car drivers information about where the chargers are located as well as round-the-clock customer service that is accessible from every charging station if the customer prefers personal contact.